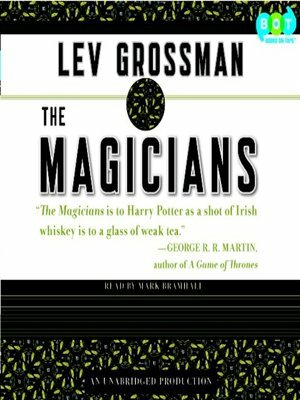 "The Magicians is to Harry Potter as a shot of Irish whiskey is to a glass of weak tea. . . . Hogwarts was never like this." "Sad, hilarious, beautiful, and essential to anyone who cares about modern fantasy." "A very knowing and wonderful take on the wizard school genre." "The Magicians may just be the most subversive, gripping and enchanting fantasy novel I've read this century." "This gripping novel draws on the conventions of contemporary and classic fantasy novels in order to upend them . . . an unexpectedly moving coming-of-age story." "The best urban fantasy in years." Quentin Coldwater is brilliant but miserable. A high school math genius, he's secretly fascinated with a series of children's fantasy novels set in a magical land called Fillory, and real life is disappointing by comparison. When Quentin is unexpectedly admitted to an elite, secret college of magic, it looks like his wildest dreams have come true. But his newfound powers lead him down a rabbit hole of hedonism and disillusionment, and ultimately to the dark secret behind the story of Fillory. The land of his childhood fantasies turns out to be much darker and more dangerous than he ever could have imagined. . . .